In THE WEDDING GIFT: A PRIDE AND PREJUDICE STORY, an enchanting novella by Anna Elliott, the story opens two weeks before Elizabeth Bennet’s wedding to Mr. Darcy. He has given her the perfect wedding gift, and now she must come up with one for him. But what do you give a man who has everything? Elizabeth soon discovers that the gift of love is more important than any one thing. DREAM OF A GLORIOUS SEASON, a sweet novella by Sarah M. Eden, we meet Elizabeth Gillerford who envies her sister only one thing—that she’s been intended for Julian Broadwood since they were children. The trouble is that Elizabeth is hopelessly in love with Julian too. When Julian discovers that Elizabeth has been denied a Season because her older sister is yet unwed, he undertakes his own stealthy measures to introduce her to society, only to find himself falling in love with her himself. In THE MENDER, a captivating story by Carla Kelly, Thankful Winnings takes a sea voyage with her cousin on the Ann Alexander, in a last adventure before she settles down to marry one of her beaus. Unexpectedly they come upon the aftermath of a fierce ship battle, and Thankful is commissioned to help in the place of an injured surgeon on one of the Royal Navy ships. Adam Farnsworth, surgeon, has been at sea for years. Tired of war, but devoted to his post, it takes a resourceful lady such as Thankful to give him the hope of love and help heal his own wounds, the ones that show and the ones that don’t. In BEGIN AGAIN, a charming novella by Josi S. Kilpack, Regina Weathers gives up on marrying for love the day that Ross Martin walks out of her life. Now, fifteen years later, Ross shows up at a ball and thinks he can woo Regina. But she is set on her lonely path and stitched-up heart, no matter the excuse Ross gives for his years of silence and neglect. When Ross insists he wrote many letters during his military years, Regina discovers a secret long-since buried by her father, and the revelation might be enough to thaw the coldness of her heart. In Annette Lyon’s endearing story, THE AFFAIR AT WILDEMOORE, Mrs. Ellen Stanhope escorts her three daughters to a ball. As her oldest flirts with a beau, Ellen is reminded of her courtship and early years of marriage with Anthony, before tragedy struck with the death of their infant son. The marriage has faded and dulled. Not until she sees Anthony dancing with a woman he courted years before does Ellen realize how much she misses him, still loves him, and yearns for him to yet feel the same way for her. In the delightful novella, THE DUKE’S BROTHER, by Heather B. Moore, Mr. Gregory Clark is having an awful day, and it only gets worse when he’s run over by … a woman. Mabel Russell reluctantly visits her sister in London for the Season, even though she’d rather stay in the country cataloging insects and aphids. When she runs into Gregory Clark, quite literally, she’s afraid to show any interest, especially since he’s a member of the dreaded ton. But getting to know Gregory becomes an unexpected delight. I just love reading novellas! They are the perfect quick fix for the end of a long day. I definitely enjoyed this collection; all are good stories and I loved several of them. 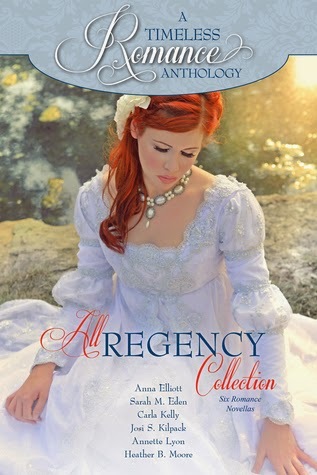 It's always a pleasure to read from the Regency era, and even though that was a theme of all these stories, each one was different very different. I found The Mender by Carla Kelly to be especially unique with it's focus on the aftermath of a battle at sea and tending to the injured. My other favorites are The Duke's Brother by Heather B. Moore and Dream of a Glorious Season by Sarah Eden.